The NWS SPC has revised its tornado risk forecast. The brown (5%) area is significant risk of tornadoes, beginning around 3pm. It now includes Oklahoma City, Tulsa, east parts of the Metroplex, Shreveport, Tyler, Baton Rouge, Gulfport and New Orleans. The highest risk should start after 3pm and continue into tonight. 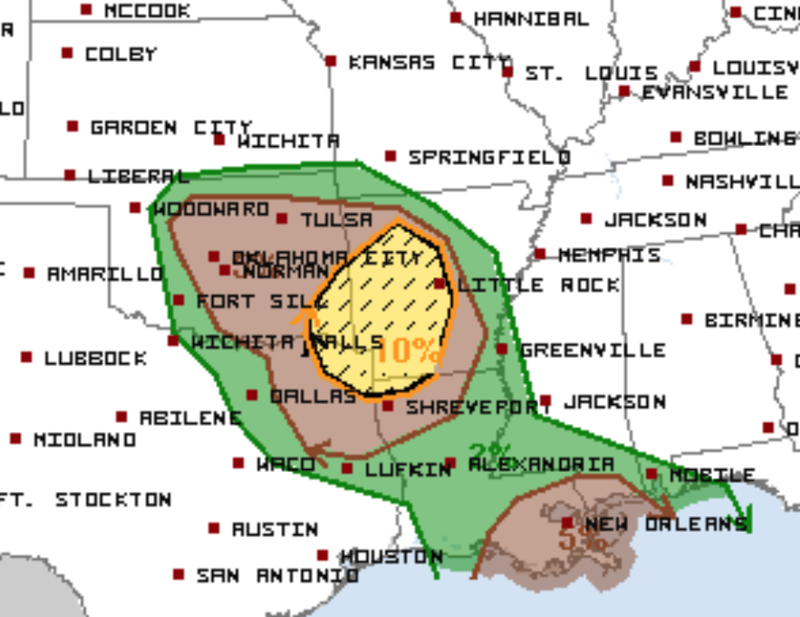 The yellow (10%) risk area is the enhanced risk of tornadoes. It includes Shreveport, Little Rock, Ft. Smith, Mena and Idabell. 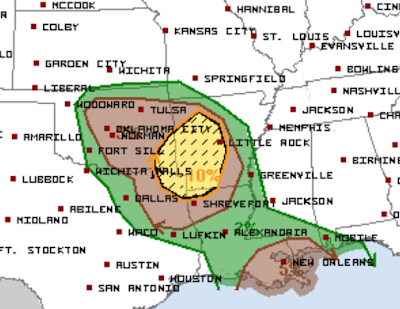 The hatched area is where strong tornadoes are forecast to occur. Because outbreaks of tornadoes are infrequent after Thanksgiving, there is the potential that people will be caught unaware. So, I recommend you notify any friends or relatives in the affected areas. I will not be available to provide any kind of routine updates. So, for your safety, I recommend monitoring reliable local sources of storm warnings. The AccuWeather app is outstanding as is Weathercall.